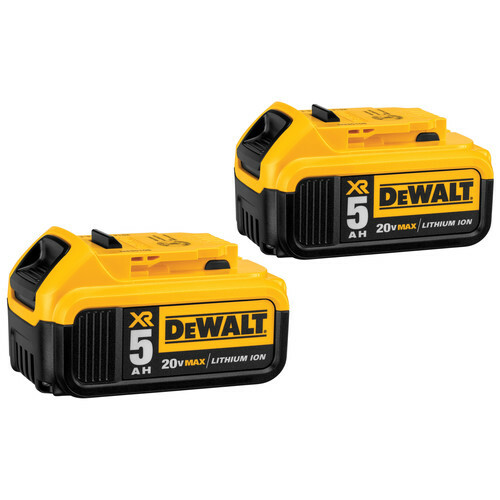 DEWALT's DCB205-2 20V MAX 5.0 Ah XR Premium Lithium-Ion Battery (2-Pack) will provide up to 60% more capacity than a standard 20V MAX battery pack. The 3-LED Fuel Gauge System allows gives you instant feedback on the charging state. And these XR Premium batteries have no memory and virtually no self-discharge for maximum productivity and minimal downtime. Great batteries with a very good run time between charges. Dewalt aspires to be the Best. They are, and I only work with the best! As a Contractor and Real Estate Developer, I’ve always sought the best in Tools to improve the quality and efficiency of my work. I admit that I still have a few Milwaukee Tools in my arsenal, and they’re still put to work, but all are Corded, and those days appear limited, especially with Dewalt’s advancements in their battery technologies. I’ll be buying even more of their batteries in the near future. Next? Their biggest and baddest. Where? Through CPO! I own 5 of these. I run my DeWalt impact driver, drill, and vaccum with these full time with 2 fully charged spares. Not that I need them... I run all of the above just about a full week with these. I use these batteries on a variety of power tools, grinder, drill, impact-drill and circular saw reciprocating saw. These are long lasting and powerful with little to no lose of power. like the extra power and work time. use these for work, cuts charging times and down time waiting for battery. I have had other cordless tools and prefer Dewalt over all the others. I like the multiple tools in the 20V range, I have 7. I have had the 14 and 18 volt tools and by far like the 20 better due to power and weight. I use the all day every day and they are perfect. These battery's last a long time! I use this DeWalt tool for building thing in my woodworking shop to screw things together, it makes everthing go faster and easyer! Great battery with lots of power. what does the warranty actually cover on these batteries? BEST ANSWER: Three-Year Limited Warranty. DEWALT will repair, without charge, any defects due to faulty materials or workmanship for three years from the date of purchase. This warranty does not cover part failure due to normal wear or tool abuse. For further detail of warranty coverage and warranty repair information, visit www.dewalt.com or call 1-800-4-DEWALT (1-800-433-9258). 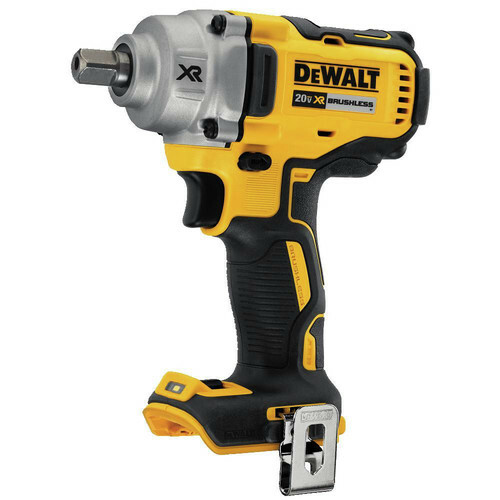 Will the 20v 5ah work with all other 20 v dewalt cordless tools, regardless of the ah rating? BEST ANSWER: To the best of my knowledge the answer is yes. The only downside is the 5.0ah batteries are heavier and physically larger. For some tools like an impact driver I prefer the lighter weight of the smaller batteries. If for example you have a battery powered miter saw I would definitely opt for the 5.0 ah. Good luck. Yes, however, for but high powered tools (i.e circular saws, high torque impact wrenches, hammer drills, rotary hammer) we recommend using 3.0 - 5.0 amp hour batteries. As long as the tool is 20 volt they will work. The amp hour is just how long it will run the tool. It is only a battery rating not a tool rating. compatibility. There are 12v MAX tools that this would not work with. Yes. The 5am/hr simply last much longer than lesser amp per hour. Yes, all of the 20V MAX tools are compatible and can use this battery. Yes it will, the Ah just means it had more capacity. Do these batteries work with the 20 Volt 6 1/2" circular saw, and the 20 Volt reciparical saw? BEST ANSWER: Yes they work with both tools. Yes they work with both tools. Will these work in the new cordless dewalt mitre saws ? BEST ANSWER: Yes,the Dewalt 20V MAX 5.0 Ah XR Premium Lithium-Ion Battery (2-Pack) will work in the 20 volt cordless Dewalt miter saw. BEST ANSWER: Yes,the 5.0 batteries came out in 2014.